And here we are again this week. I hope you’re ready to finish that iDVD menu we’ve been working on, ’cause here we go! It’s time to put on the finishing touches and add some Easter eggs. In case you haven’t been following along, here’s part one and part two. If there is no transition specified, iDVD will simply jump to the menu or movie that you click on. While this works in a pinch, we can enhance the viewing experience by choosing a built in transition. Get your project loaded in iDVD and select a button from your menu. Bring up the info window. At the bottom is an area for setting transitions. iDVD ’08 comes with twelve transitions to pick from. Simply choose one from the top pop-up menu. My favorites are Dissolve, to go between two menus, and Fade Through Black, to go between a menu and a movie. Once you’ve selected your transition, the bottom pop-up menu will display further options for customizing your transition. These controls allow you to change the direction of effects such as Flip, Push, and Wipe. The best way to choose one of these is to use iDVD’s test mode to try out different settings until you find something that you like. 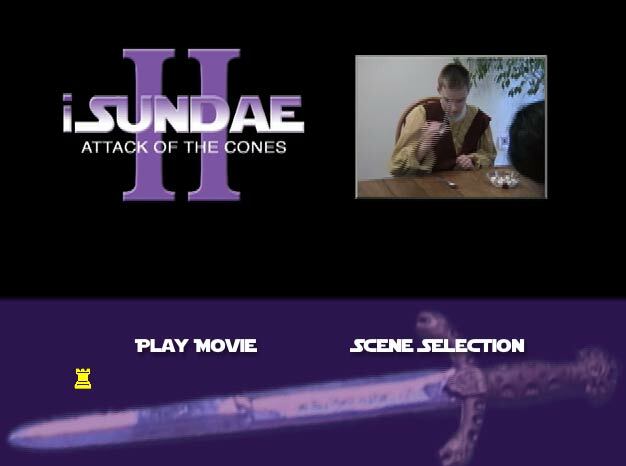 Professional DVDs often contain hidden features, generally known as “Easter eggs.” For my latest movie, I couldn’t stand not being able to do them any more. So I set out to create an Easter egg on my DVD. Drag your Easter egg movie into iDVD to add it to the project. You should do this on the menu that you want the egg to appear on. You may have to tweak the new button so that it matches the others. It’s pretty visible right now, isn’t it? Let’s fix that. Select the title of the egg by clicking it twice (pause between clicks or you’ll play the movie). This next part requires that you have Apple’s great Character Palette application open. It’s kind of hidden, so I’ll tell you how to find it. 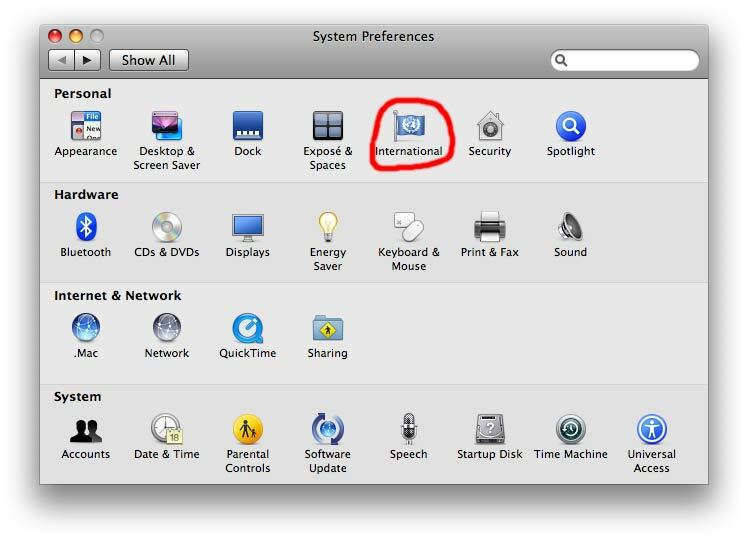 Open System Preferences and get to the International preference pane. Click the tab labeled “Input Menu.” At the bottom of the preference pane is a little check box for enabling the input menu. 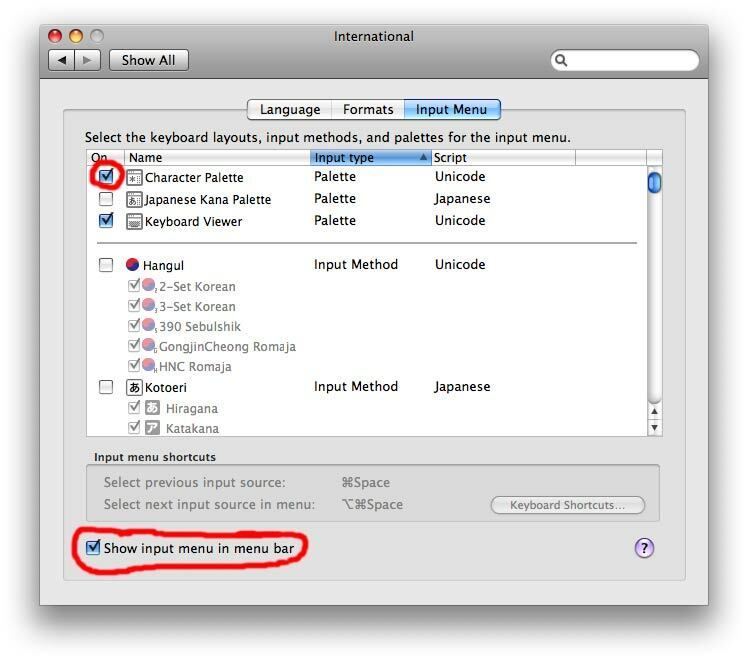 After you click this, a little flag will show up in your menu bar. 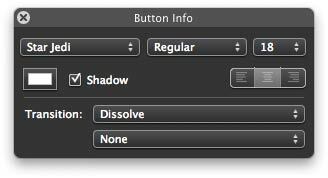 Now go back to the top of the preference pane and enable the check box for Character Palette. 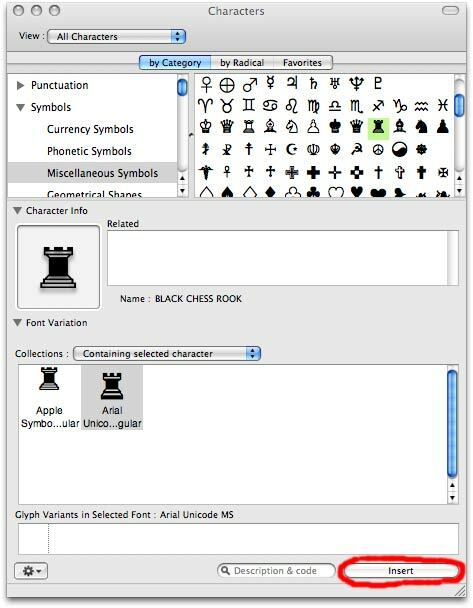 With the Character Palette enabled, you can close System Preferences. Click the flag that appeared in your menu bar and select the Character Palette item. You now have a palette of all the characters that your computer is capable of producing. Just browse through them and find something that you like. Make sure your Easter egg’s name is still selected, then go back to Character Palette and click the “Insert” button. This types the character in the egg’s name. You might have to edit the font size to make your Easter egg large enough. We now have a cute little symbol for the Easter egg icon. It’s looking good, but the egg is still visible. We want it to be hidden until somebody navigates to it. To hide the Easter egg, first move it to the place where you want it to be. Most professional DVDs hide their eggs in places off to the side of the menu items. Click the button to bring up the info menu. 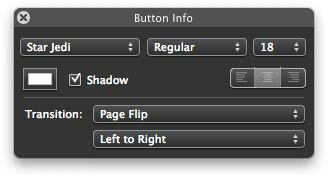 First, uncheck the box that enables the button’s drop shadow. Next, click the color swatch to bring up the color picker. 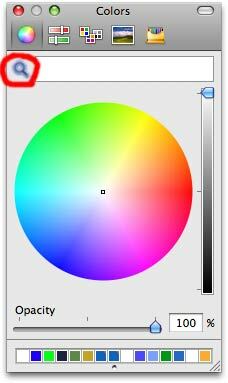 If you click the magnifying glass on the color picker, you will get a color select tool. Use this tool to pick the color of the background that your egg will go on. This sets the Easter egg’s text color to the background color, effectively hiding it. When someone navigates to it, however, iDVD will highlight it with a different color, which will show the Easter egg. Speaking of highlight color, you can change that quite easily. Make sure nothing is selected, and then bring up the info menu. Under the “Buttons” section of the menu is a highlight color option. Set this color just like button color. I’d choose something bright, like yellow or orange. Note that this is global highlight color, so it’s the same for all buttons. 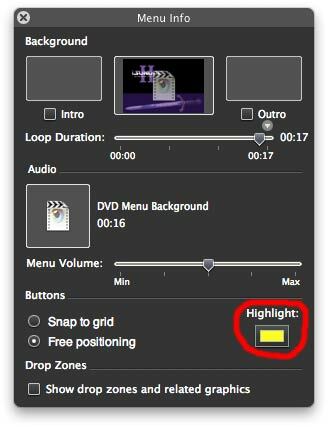 Depending on the theme, iDVD will either highlight the text, or add a bullet next to the highlighted button. If you’re like me, you probably want to change this. Just select a button (or all the buttons), and then click on “Buttons” at the bottom of the iDVD menu. 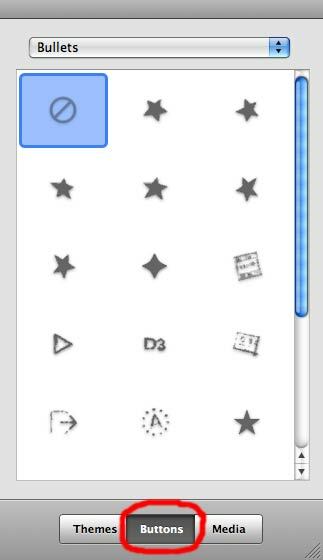 This changes the side menu to display button editing options. Select “Bullets” from the pop-up menu at the top, bringing up a long list of bullet types to choose from. Choose one you like, or choose the “no” symbol to turn off bullets altogether. This only affects selected buttons. And there you have it. There’s still plenty that you can tweak on your menu, but I’ll leave that up to you to find, or up to future articles. This entry was posted in Blog, DVDs, Movies, Software, Tips and Tricks and tagged dvd, easter egg, iDVD, menu, movie, transitions. Bookmark the permalink.